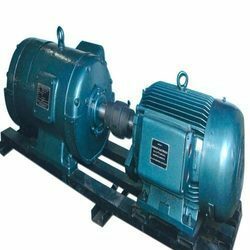 Motor generator set are also used to convert voltage, phase and frequency of power. They also find application in isolation of electrical loads from the supply line. Here is a pictorial representation of a MG set. Here a motor and a generator are coupled together using a single shaft; they are wound around a single rotor. Necessary condition for coupling is that rated speed of both motor and generator should be same. We are a noted name engaged n offering our clients with High Frequency Motor Generator Set / DVDF Test Set Up. The sets comprises Motor and a Generator, both mounted on a common base plate. These are attached to each other through coupling. Current of these tests are provided as per the specific requirements of our clients. Widely used for distribution and power transformer test & P.T., these are offered with following.